We’re all familiar with the slogan “Reduce, Reuse, Recycle,” and most of us do our part to keep cans, bottles and newspapers out of the landfill. Some take an even broader approach and explore ways to reuse materials that have outlasted their original purpose. The concept of conservation isn’t new, of course. Long before the Green Revolution was a twinkle in Gaiam’s noble eye, people have been “making do” in times of need, for necessity really is the mother of invention. The patchwork quilt was born out of just such a necessity. Scraps of cloth stitched together made for warm bed coverings. Over time, the original utilitarian purpose met with the desire for beauty, and the quilt evolved into an art form that still flourishes. Recent times have seen a resurgence of arts and crafts using would-be cast-offs. Objects are salvaged, upcycled, repurposed, embellished and altered. Shabby-chic, wearable art, assemblage, mixed media, steampunk and bling are all in vogue. The trend has gathered a momentum that shows no signs of slowing down. Want to get in on the fun? If so, then the Summit County Library is a great place to find all sorts of books that are sure to spark your imagination. 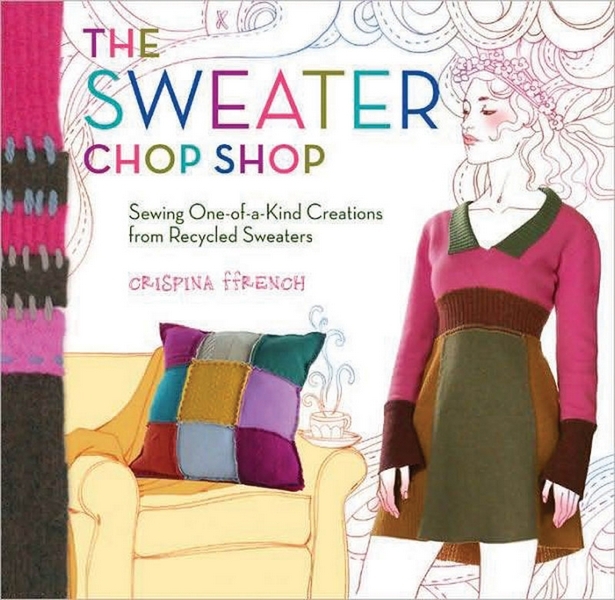 Carly Simon is a great fan of Crispina ffrench’s – yes, that’s how she spells her last name – “The Sweater Chop Shop: Sewing One-of-a-Kind Creations from Recycled Sweaters,” and so is Ben Cohen (of Ben and Jerry’s ice creams), who describes the book as “amazing and magical.” “Alter This! Radical Ideas for Transforming Books Into Art,” by Alena Hennessey, is directed at juvenile readers and teaches them how to turn phone books, art books and even grammar books into exciting and eye-catching items of real art. The text is irreverent, the photography beautiful and the techniques creative and well-taught. Lavish illustrations accompany each project in “Sumptuous Patchwork: 30 Exciting and Original Patchwork Projects with Embroidery, Beading and Stenciling,” which will appeal to novices and master makers alike. Techniques are described step by step and are just right even for the most sophisticated of tastes. “Upcycling Celebrations: A Use-What-You-Have Guide to Decorating, Gift-Giving and Entertaining,” by Danny Seo, America’s leading authority on modern, eco-friendly living, offers 100 projects for parties and holidays. From a summer barbecue to Thanksgiving to New Year’s Eve, Danny explains how to turn the ordinary and everyday into striking, unique objects that guarantee successful entertaining and a truly festive occasion. What are you waiting for? All these and more are available at your Summit County Library. Have a great time and help save the planet, too!